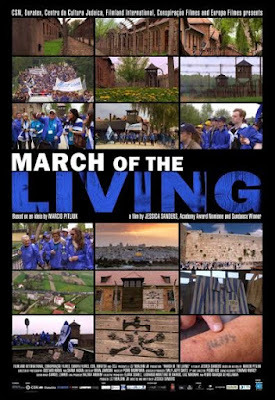 MARCH OF THE LIVING is the story of the annual gathering of Jewish children who travel with Holocaust survivors to Auschwitz to learn and see first hand what happened. Very good film about passing on the truth of history to the next generation is going to play differently to different audiences. For those who don't know or don't believe the story of what happened when upwards of 12 million people, over 6 million of which were Jewish were sent to the camps by the Nazis this film is going to be an eye opening experience. For anyone who is a teenager , like the ones in this film, MARCH OF THE LIVING is going to be a smack in the face as the stories become more connected to reality and a little harder to disbelieve. For those of us who know the stories, MARCH OF THE LIVING is going to play like a really good footnote film. This isn't to diminish the film in anyway, but there is point watching the film when I realized that I was not the right audience for the film. Yes it was great to see the march and how it bridges generations, But at the same time there is a little too much Holocaust 101 for the informed audience. I like the film a great deal and it's going to one that I'm going to show my niece when she gets to be a few years older so that she knows what happened. If you don't know, or don't believe this film is a must see.